How can I import my shifts into iCal, Google Calendar or Outlook? 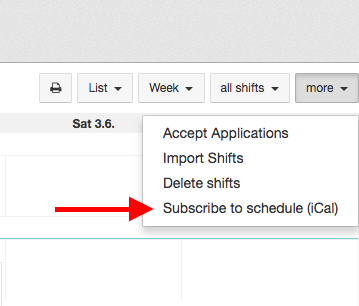 You have the option to import your shifts into iCal, Google Calendar or Outlook. A new window will open where you will be given an API-link. Follow the instructions to import your shifts into iCal, Google Calendar or Outlook. Please note: the weekly schedules will be imported into the calendars four months into the future and one week in the past. This will update automatically. You can either import the shifts from all employees or just your own. Notice: you (admin) have to be assigned to at least one department within all locations in order to see all shifts.